‘Annoying’, ‘vexatious’, ‘irritating’, ‘teasing’—Spring this year is all of these things. After a few glorious weeks of forsythia, daffodils and crocuses, came the rains, gray skies, dropping temperatures. We had a playful peekaboo sun early in the week, then a hailstorm trashed my herb garden. Since early April, though, farmers’ markets hereabouts have been awash in springtime produce: especially fresh greens, monk’s beard, artichokes, rhubarb and asparagus. And nettles! On a Sunday afternoon cycle into France during this spring’s false start, I stopped for lunch at La Couronne d’Or in Leyman, just across the border. The restaurant offers a full menu through the day, which makes it an ideal destination outside standard mealtimes. A week ago, I joined Jack and Silvia of Laughing Lemon for an evening of cooking with springtime veggies. 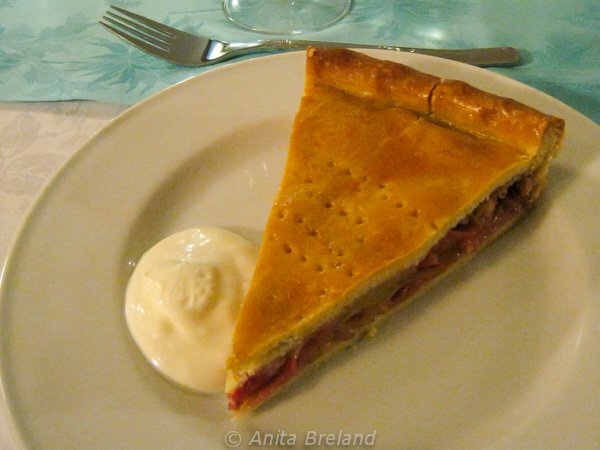 We made a rhubarb-strawberry pie. We sampled Italian tomatoes, Swiss radishes, raw asparagus and yes—raw nettles. And for me, who adores any kind of risotto, there was something new to try: risotto with white asparagus and nettles as the signature ingredients. At a spring cooking class with Laughing Lemon, we sampled Italian tomatoes, Swiss radishes, raw asparagus and yes—raw nettles. 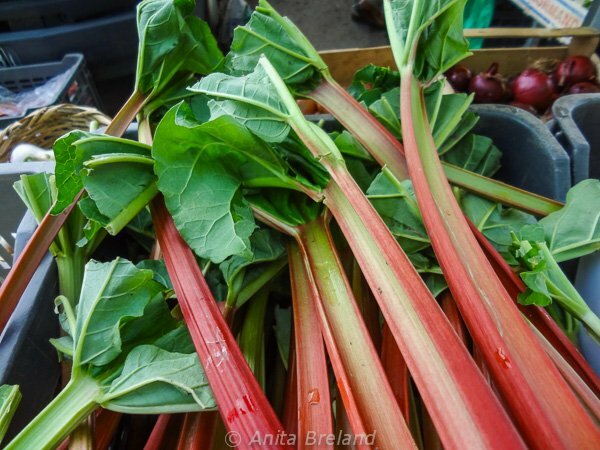 Makings for rhubarb pies and compotes, tartly sweet spring favorites–perfect “go-withs” for nettle dishes. From Laughing Lemon, a tasty end to a spring-time meal. Nettles are not exactly a designer foodstuff. After all, they can be had for free along the roadside. But they’re chock full of vitamin C and other antioxidants. They kept much of Europe nourished through two world wars. A little foraging online brings up more information than one home cook needs to know, but I like Austerity Kitchen’s post on the weed (complete with an instructional rhyme). And thanks to Smithsonian Magazine, I’ve added this recipe for nettle soup to my repertoire. Said to be the remedy for everything from asthma to hair loss, the claims for the health benefits of stinging nettles are many. I like them because they’re bright green and scream “Spring!” Until the real thing is well and truly here, that will have to suffice. 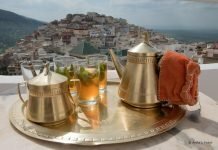 Update, spring 2013: This is my contribution to Spring Fever, a blog carnival hosted by Traveling with Sweeney. Join in, and leave us with your thoughts on Spring! I’ve taken nettles for allergies. Not sure if I’ve even eaten them. Trying to figure out if the first photo is a nettles terrine. It looks delicious! It is nettles indeed! 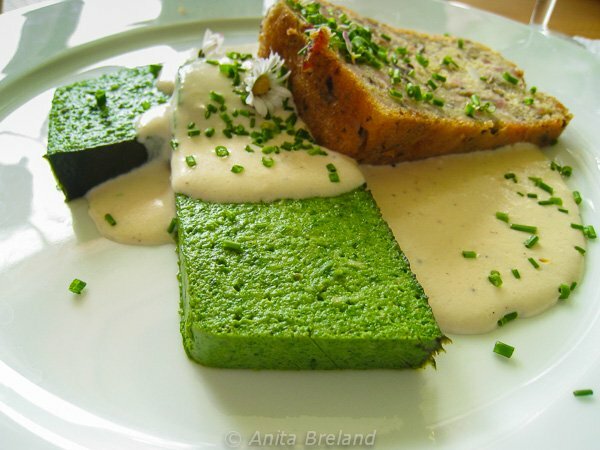 The very terrine mentioned in the post–“only nettles, Madame!” Do you know nettle tea? Also tasty. I had no idea about the benefits of nettles. They do indeed “scream Spring”! Everything looks so fresh and delicious in your photos. Thanks for joining the blog carnival. I can’t get over the green in the top photo. I never think of nettles in spring – more asparagus and fava beans. Startling isn’t it? Asparagus and fava beans are also way up there on my spring-food-faves list. In fact, the list just keeps growing! I like your take on Spring. Those daffodils blew my socks off. What clarity and colour. 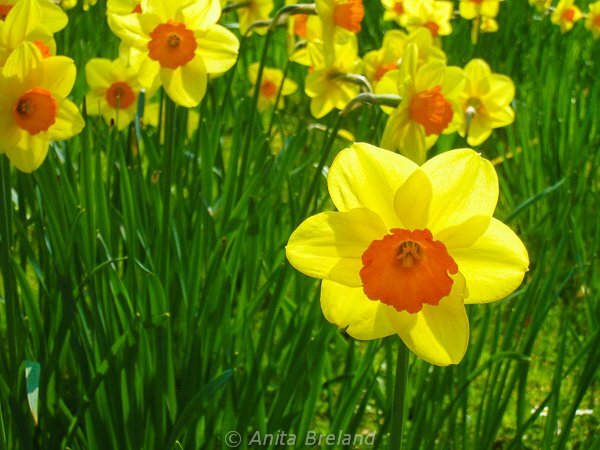 Thank you Jan. It’s still a little early for a full-blown round-up of spring flowers here, but the daffodils give me hope! I’ve never had nettles but with Vitamin C and antioxidants, it’s definitely worth looking into. Will check if we have something similar or from the same family. 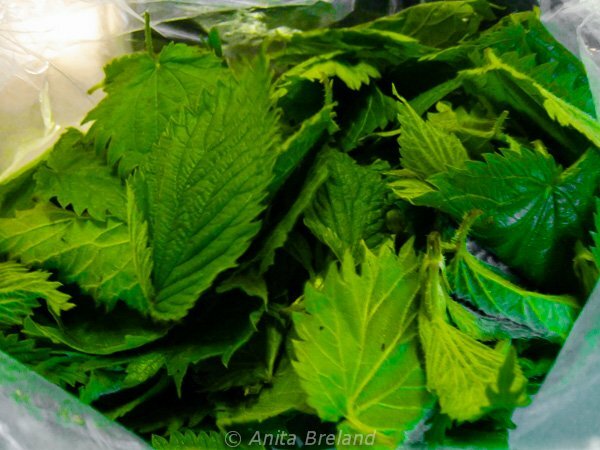 Nettles were a discovery for me, when I moved to Europe. It would be interesting to know of similar greens from your part of the world! That first shot puts my taste buds into overdrive. Not sure if I have ever had nettles, but must give them a try. 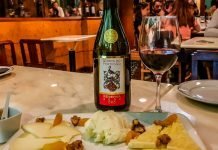 The French do have a way with food, don’t they? That terrine surprised even my friends from Paris!